This project engaged with the questions: What does it mean to be a healer? To be healed? We treated these questions as starting points for an ongoing conversation about the nature of suffering, illness, and health. Through observing shifts and talking with students and practitioners of Chinese medicine at the National University of Natural Medicine in Portland, Oregon, we sought to bring these healers into the conversation. How do they practice care and intimacy in their practices? As ethnographers, what is our role in the healing encounters that we observed? Through textual analysis and group discussion, we looked to ethnographic sources, texts in Chinese medicine, and other models of care, asking, “What could healing look like?” Accepting an ethical responsibility to simultaneously consider the nature of suffering and of healing, this project aims to address the human condition as a constellation with multiple points of entry, rather than as stacked and disparate layers. When I first stepped into this project I had come out of a semester where I felt incredibly disenchanted. I felt as though I was bound in terms of communication, I felt limited by academia. Even though it was clear to me that there were many other facets and possibilities for communication and language, I was struggling at finding a way for me to express and explore the possibilities. I had just finished my own auto ethnography where I used myself, my body, my trauma, and my chronic illness as an entry point into discussing bodily memory in relation to trauma and how systemic and other ‘invisible’ violence manifest in the body. With trauma and bodily memory on my mind as interests, I set into this project hoping to locate possibilities of treatment for trauma and to see how in the practice of Chinese medicine these ideas were being dealt with. This project gave me the means to put my own wonderings of the world into a less abstract form and into the bodies of the practitioner, patient, and myself as we occupied and created a space of healing. I began this project as a pre-medical student with little knowledge of alternative medicine but a strong investment in questions of healing and different possibilities for care. I had worked in a number of biomedical settings—as an clinical research intern in a Vascular Surgery department and a volunteer in Pediatric Oncology and a Pediatric Emergency Room. My experiences as a “practitioner” (a volunteer or intern) varied dramatically from my experiences as a patient/family member of a patient, and I was familiar with both the healing and pain that practitioners can inflict. Coming into this project, I was particularly interested in the areas where I feel that biomedicine lacks a vocabulary and a framework, such as trauma, which interrupts biomedical ways of thinking about the mind and body. 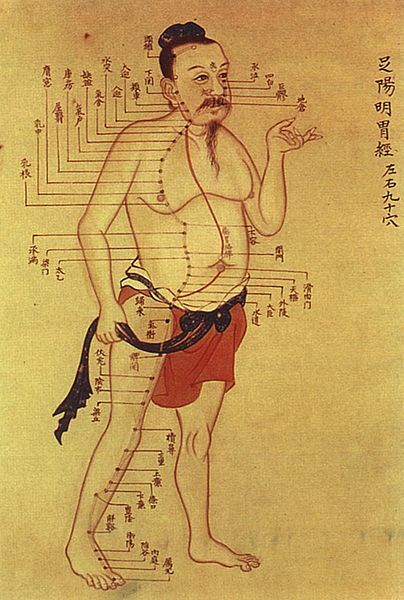 I wondered, what frameworks might Chinese medicine offer for an integrated, embodied understanding of trauma? What are the implications and consequences for my future practice? The National University of Natural Medicine (NUNM) is located in Portland, Oregon and was founded in 1956. It offers advanced degrees in oriental medicine and naturopathic medicine, as well as programs in global health, nutrition, and, as of recently, undergraduate degrees. During our research, we worked mostly with students and professors from the program of oriental medicine. This particular program teaches classical Chinese medicine, which emphasizes studying the classical texts. NUNM and its practitioner-professors are affiliated with a number of health clinics throughout the Portland area. At these clinics, a practitioner-professors lead four hour shifts, where they supervise a group of interns. Each member of our team conducted participant observation during at least one of these shifts. Lacey’s shift took place at the NUNM Clinic, located on the NUNM campus. Bridgette’s shift took place at Outside In, a Portland-based organization that provides services to homeless youth and marginalized individuals. Sepideh shadowed shifts at both. When I think about a response to the question where am I now? or where will I go and what I have I learned or what has been answered since the project I can only think of how it has expanded my vocabulary and has taught me the ongoing lesson it is to be listening and tuning into the world. My understanding of healing is a much more expansive one but also a very simple one. I think often of our discussions and how the questions we asked were always ‘what ifs’ but what met us at the end of the if was always something so simple. These questions always felt like a return, a reminder to look and be present with what stands before you. What could healing look like? What would happen if we treated everything as if it were beautiful? If we listened to everything as if it were a teacher? What if healing looks like helping someone die? What if death is just another drop in the river? This project reoriented me in the world in a way where I am forced to imagine and question more, to listen deeply and broadly to myself and others. To recognize the limitations of my experience in how it relates to others or in other words, that people will never know the experience of the other but perhaps there are many ways one can Know and be present and even take care. This project has broken open my understanding of how to care and heal. Rather than defining my career plans as becoming an “MD,” I now consider my goal to become a “healer.” Even if I pursue the same educational path, considering myself in this way puts me in conversation with an entirely different group of people: artists, poets, shamans, academics—anyone engaged with questions of well-being. This project has also opened up paths for my own personal healing and allowed me to break down the barriers between myself as person, as student, and as practitioner. By coming back into my body, I make healing possible for both myself and my future patients. Finally, I have a renewed respect for being present with people and loving them—what could be more healing than that? During our research, we worked with a number of concepts, some drawn from our ethnographic sites, and others drawn from theoretical sources. Centrally, we focused on the concept of care and the question: What could healing look like? Where am I (my embodied self) during participant observation and interviews? What relationship do I have with health and illness? Who is the practitioner? Who is the patient? How to close back up the body? Questioning concepts of empathy: can you really feel what they feel?